Playing in a park, the 2-year-old came over to the bench where his mom was watching him. At that moment a metal bar from an adjacent building site fell on him, amputating his thumb. The alert mom picked up her crying, bleeding son, retrieved the thumb and rushed to Hadassah Hospital Ein Kerem. 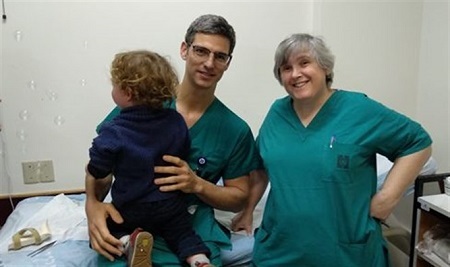 Using microsurgery under a microscope, Dr. Carole Pidhorz, an orthopedist, and Dr. Yonathan Wagman, a plastic surgeon, worked together to successfully reattach the thumb. A thumb is important but difficult to reattach. The mom had great instincts to find the thumb and bring it with her.